It only took me an hour into playing Grim Fandango: Remastered before I had screwed up a puzzle so badly that I had to start it over from scratch. There is no “failure” in Grim Fandango—only repetition. There is no death, either—which makes sense, given that the protagonist, Manuel “Manny” Calavera, is already dead. If Manny performs actions in an unsatisfactory order, he can try again, ad infinitum, until he gets the outcome he wants. It’s a game about a bureaucratic purgatory that also is, itself, a bureaucratic purgatory. Grim Fandango has never been a forgiving game. The original 1998 game had notoriously frustrating third-person controls, unclear directives and game-breaking bugs. The “Remastered” version seeks to change much of the original iteration’s inaccessibility by incorporating simpler point-and-click mechanics—and, in my experience, far fewer bugs. I didn’t open any elevator doors by accident! Sure, Manny still occasionally strutted in the wrong direction from what I had told him to do, and sometimes when I forgot to put away an item before exiting a room, the game stuttered and slowed. What little I noticed, though, paled in comparison to the horror stories I’ve heard about the original iteration (lost saves, glitched-out, unsolvable puzzles, and so on). The Remastered version changes nothing at all when it comes to the often bizarre solutions to Manny’s many obstacles. No need to rewrite the old Grim Fandango walk-throughs! The game’s graphics look much the same to the 1998 iteration, as well, but the load screens and CD-ROM putterings have been replaced by wait-free transitions. The whole game feels cleaner and faster—well, except for Manny’s slow walk animation. I double-clicked to force him into a run most of the time, and occasionally double-clicked to skip over repetitive animation sequences, but Manny’s default slow walk feels about right for the game’s overall pace. Sometimes I would let him saunter just because it went better with that familiar jazzy soundtrack. I could go on about how much I appreciated the new control scheme for the Remastered edition, since that’s the biggest change this time around, but I suspect that many modern gaming fans have not completed nor even played the original at all. I know I found it frustrating; the puzzles may seem intuitive to some people, but if you ask me, there’s no logical reason why skeletal pigeons would care one way or the other about a pink balloon animal (spoilers? … not really, since that clue isn’t going to help you at all). The combination of bizarre puzzles, clunky third-person controls and confusing camera angle switches made the game feel opaque and inaccessible to me. The camera angles and puzzles remain, but the updates to the control scheme are enough to allow me to actually start enjoying the game. Finally! The narrative was, and still is, delightful and strange. I went in worrying that a game about Latino characters written by white people in the ‘90s would feel pretty embarrassing on second glance, and that there would be a lot of regrettable jokes. On the contrary, the game’s blending of different literary genres allows it to dodge stereotypes most of the time; the employment of Latino voice actors, particularly to help write additional Spanish slang and phrases, can’t have hurt. 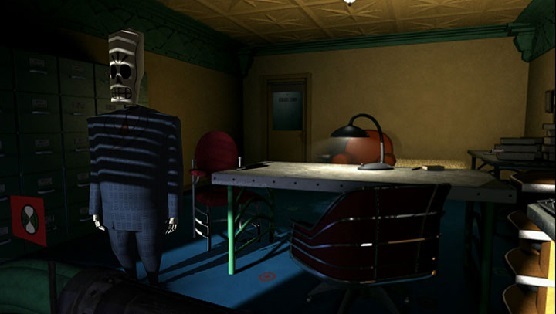 The long list of influences on Grim Fandango, according to the game’s director Tim Schaefer, include masculinity-centric stories like The Maltese Falcon, Glengarry Glen Ross and Chinatown—stories of brusque men with something to prove and/or elusive damsels in dire straits. But citing these influences does Grim Fandango a disservice in some ways. I can see the similarities in plot, structure, and tone—but citing these influences suggests that Grim Fandango is derivative, rather than a twist on these classics. Speaking of classics, Tim Schafer did not cite Sartre as one of his influences for this game, but the extensive similarities between this game’s narrative and Sartre’s The Chips Are Down (and, to a lesser extent, No Exit) surprised and delighted me. I’m not going to claim that there is some deep similarity between all stories about the afterlife and death—that seems unnecessarily facile—but the romantic sentiment of Grim Fandango’s story almost convinced me that such a thing could be true. Maybe there is some deep human understanding of death that can be felt in all of these different stories. Unlike your Chinatowns and your Sartres, however, Grim Fandango offers a chance at redemption, and an ultimate belief in hope. Most of the time, I think other people get nostalgic about old games for no reason. When I go back, I feel disappointed and angry to have been let down by false promises. There’s still plenty to disappoint me in Grim Fandango—the puzzles that made no sense the first time are still just as nonsensical as they always were, there’s still some late-‘90s clunkiness inherent in the design that no amount of reworking could remove, and it’s still fundamentally a story about a grubby-guy-who-makes-good while saving his virginal love interest. But those are only the barest bones of the tale, and there’s more meat here than there appears to be. 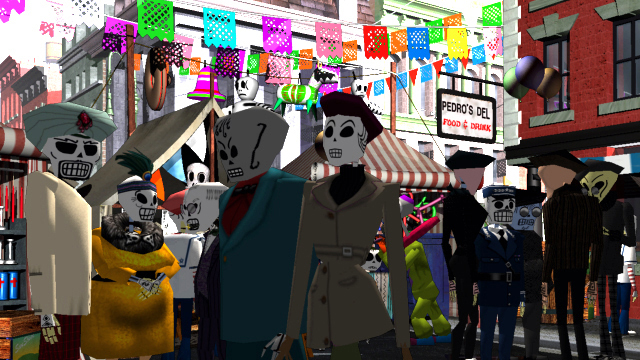 What matters most is not the story, but the telling—and that much, Grim Fandango has mastered. Thank goodness it’s no longer unplayable. Maddy Myers is Paste’s assistant games editor. She tweets @samusclone and co-hosts a weekly gaming podcast called Isometric on the 5by5 Network.